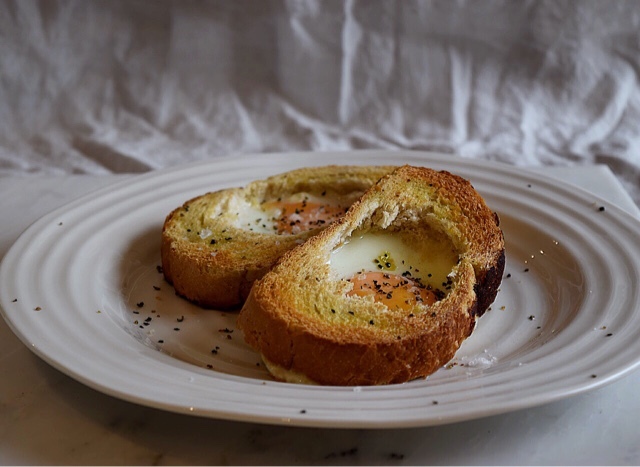 Hole in One eggy toasts, a brilliant 2-in-1 brunch. These are as easy as they are delicious. They are also sinfully simple and unique to serve up on a lazy Sunday morning. These have been doing the Pinterest circuit for a few months now and I have been meaning to do them for ages, however I always forget and get so carried away poaching or scrambling my eggs that the moment has gone and I just carry on with traditional eggs on toast. This works really well with a chewy sourdough, I like to drizzle mine with good quality olive oil, on both sides which gives the toast a warm golden colour when toasted and also crisps up your bread nicely. Tasty ketchup if you fancy it, though these are delicious without any sauce. Slice up your bread and place your Cookie cutter in the centre of each slice and cut out a hole. These leftovers make perfect dippers so save and slice up these bits. Drizzle each slice with oil, and place in the pan for a few minutes, let this side turn golden and then flip over. Now crack your egg into the hole in each slice and let the eggs lightly fry away. Once these are nearly cooked, but the white is still a little runny, place under the grill to finish off. Coat with pepper and a little salt and enjoy with a fresh pot of coffee. Don't forget the extra dippers - smother in butter dip away. A different and fantastic brunch for guests, friends and family.